Kosovo has lost an estimated 50,000 people in the past two months - most of them on buses bound eventually for Germany. What is going on in this tiny corner of the Balkans? Nysret Ismaili surveys the small group of children playing on the flinty school football pitch, set in the plains below Kosovo's rolling hills, and knows he has a problem. His school is in trouble. In the past two months, 36 of his pupils have left, taken by their parents out of the country in the biggest exodus of Kosovans since the war. Their small, tight-knit farming community in Lug, 15 miles north of Pristina, is shrinking; his staff face an uncertain future. "It's a catastrophe," said Mr Ismaili. The Kosovan ministry of education agrees – 5,200 pupils have left schools nationwide since December. He opens the door on Nazmije Hiseni's rowdy class of six-year-olds, singing Balkan folk songs at the top of their lungs. She smiles weakly. Four of her 20 pupils have left, and she faces redundancy, as Mr Ismaili will be forced to merge two classes. Is the Croatia vs Serbia genocide verdict a reminder of The Hague's insignificance? "This has never happened before," he said. "We are on the brink." Since the end of November, an estimated 50,000 Kosovans have left this small Balkan nation of 1.8 million – mainly headed for Germany, where there has been a large diaspora since the 1970s. The youngest country in Europe, Kosovo gained independence in 2008, following Tony Blair and Bill Clinton's decision to bomb Serbia into retreat in 1999. It is also the poorest, with annual GDP per capita at £2,500. Work is non-existent in many areas – unemployment averages 45 per cent, rising to 60 per cent among those aged under 24. In a country whose most valuable export appears to be pop singer Rita Ora, the lure of the wealthy West is strong: asylum applications from Kosovans in Germany rose in January by 572 per cent, year on year. But precisely why this is happening now remains a mystery – the economic situation is nothing new. Hashim Thaci, the influential foreign minister and deputy prime minister, said it was due to "false rumours" that Germany was about to loosen its asylum policy. People traffickers have apparently been selling the myth that Fortress Europe was preparing to open its doors. Those fed up with the economic slog and the political impasse seized their moment – at the end of January the largest riots since independence broke out in Pristina, amid frustration at six months of wrangling between ruling parties. Kosovan media reported nightly the story of the exodus, fuelling the theory that now was the time to go. And some suspect that the Serbian authorities who saw the convoys of buses leaving Kosovo were happy to turn a blind eye to the crumbling of a country whose independence they refuse to recognise – the mass desertion of Kosovo served their political purposes nicely. Plus, with thousands of people boarding buses to Belgrade and then on to the Hungarian border, business was booming for Serbian entrepreneurs – both legal and illegal. "I've not seen anything like it since the war, since the Serbs kicked everyone out," said Venton Demiri, who for the past 30 years has coordinated traffic at Pristina's central bus station. At his desk, with his cigarettes and coffee, beside the full-blast electric heater in his office, he watched as the people poured in to buy a ticket for the six hour trip to Belgrade. Buses were so full that the €15-tickets had to be bought a week in advance; up to 13 buses a night would leave. Most passengers, he said, were young men. "It's sad for Kosovo. But there is no hope for people here. They're leaving because they are desperate." Outside a young family was boarding the 10.30pm bus – their children, aged two and three, wrapped up against the bitter cold. The father explained that he was earning €70 a month, and could not feed his family. They hoped to make it to Germany. Such dreams are usually ill fated. Germany, which is home to half of all Kosovans living abroad, rejects 99.7 per cent of their asylum applications. Kosovo is considered stable and secure enough for repatriation, which is usually a quick process. On Wednesday, The Telegraph watched as a group of six young men were escorted by police onto their plane in Munich, and sent back to Pristina. On Thursday several more left via the same route. On Friday afternoon a further four were returned. And this week the Kosovan authorities hope to make a show of the returnees, bringing television crews to the airport to dissuade others considering the journey. Germany has opened four new centres to process Kosovan asylum claims, and last week sent border guards to help Hungary – where 20,000 Kosovans are currently in detention. Word does appear finally to have got out that the "open doors" story was a myth. The number of those leaving has slowed. More and more people are returning empty-handed, with tales of woe, having sold their cars and left their jobs for their failed adventures. On Saturday the front page of Koha Ditore, one of Kosovo's main daily newspapers, published an advert from the Austrian government which stated: "Smugglers are lying. There will be no asylum for economic reasons in Austria. For staying illegally in Austria, you may be punished by up to €7,500." Johanna Mikl-Leitner, the Austrian interior minister, raised the issue of asylum seekers during his Friday visit to Pristina. "We will have a charter plane every two weeks and if there is a need we will engage more planes," he said. "We are discussing turning these people back also via land routes." But it has left a bitter taste. A little over two months ago Robert, a 28-year-old labourer set off from the town of Gjakova. On arrival at the Hungarian border, his Serbian taxi driver handed him over to the Hungarian police – a judge fined him €60, and let him go. Robert continued through Austria – where his asylum application was rejected after two weeks of deliberation. Released from a detention centre near Vienna and with €40 from the Austrian authorities, he continued on to the German city of Mannheim, paying €92 for the express train into Germany. He moved on to France, meeting up with a brother who six months earlier had sought asylum in Mulhouse and is still awaiting a decision. But Robert's own asylum claim was once again rejected, so he went to try his luck in the Swiss city of Basel. They took a fortnight to reject his application, gave him 110 Swiss francs, and told him to get out of Europe. This time he listened, worn out by the process and having used up all his savings. He returned to Kosovo three weeks ago. "But I'll try again," he said. "There is nothing here for me." In Pristina, the mayor, Shpend Ahmeti, understands why people like Robert try to flee. One in four Kosovans live abroad, and 13 per cent of the country's GDP is from remittances. "I don't blame them," he said. "I've never seen such dissatisfaction. "Just yesterday a man with an economics degree came to me and said: 'If I don't get a job this month I am taking my family to Bulgaria.' What could I say?" But while he has sympathy for the emigrants, he has little time for the government – his own upstart movement, Vetevendosje ("self-determination"), is in opposition; the burly Harvard-educated economist is seen as one of their brightest rising stars. "The government simply does not have an economic plan," he said. "People are not leaving because they don't have money in their pockets. They are leaving because they have no expectations of being able to make any money over the coming years." He argues that Kosovo needs to create jobs and attract investment to make the country a worthwhile place to live – foreign direct investment shrank last year, despite a modestly-growing economy, and the country's largest export is scrap metal. It has one of the largest trade deficits in the world, with almost everything imported and no pre-1990s industry remaining. "This really isn't rocket science. We need to start substituting our imports for home-grown produce; it's not OK for us to import garlic and onions from Egypt, while our land lies empty," he said. Since being elected mayor last year, Mr Ahmeti said he had made efforts to improve the business climate in one of the most challenging countries in Europe – organised crime and corruption are rife. In a city whose skyline today is dominated by minarets and cranes towering over half-built skyscrapers, Mr Ahmeti ordered an immediate halt to illegal construction, angering many black market consortiums. He said he had also handed over 80 files on organised crime – but that the government and judiciary had not yet acted on them. An assassination plot against him was uncovered in May – less than five months into his tenure. "We don't have a functioning state," he said, undeterred. "Half of our people are abandoned. "And part of the problem is that we compare ourselves to Palestine and say we're not too bad really – when we should be comparing ourselves to Slovenia, and aiming high. We are a young country in every sense, and we should be doing better." Across Mother Teresa Square, the government takes a different view. Bekim Collaku's office windows are still smashed – a remnant from the violent January protests – but the minister for European integration sees their anger as the fault of the EU. "This generation is extremely frustrated," he said. "Kosovo has a huge diaspora, yet just to get an appointment for a visa takes six months. People feel trapped." Kosovo is the only country in the region not to have a visa waiver scheme within the Schengen area – even Moldovans can travel without a visa, which rankles in Pristina. But surely the exodus is due to his government's economic and political policies, rather than the visa situation? "It has been a worrying situation, but now the numbers leaving are falling," he said, adding that the 3,630 asylum applications in Germany last month were in reality a tiny figure. 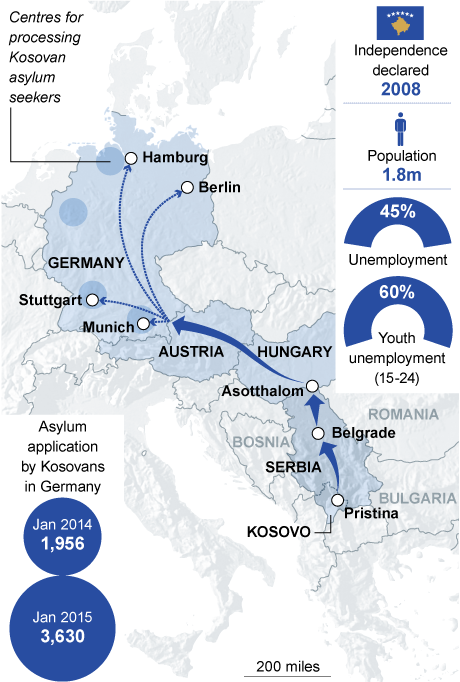 The EU's most recent statistics show that 20,000 Kosovans applied for asylum in EU nations in 2013 - accounting for five per cent of all applicants. Over the same period, some 50,000 Syrians and 40,000 Russians applied. "Our post-war transition is almost complete. It has taken a little longer than many hoped, which has made people frustrated. But now we can concentrate on the future." Back in the village of Lug, Sadik Bulliqi, the 64-year-old school caretaker, is locking up for the night. One month ago two of his sons left – Sultan, 20, and 25-year-old Avdyl. They had been unemployed for a year after the local sunflower oil factory, Flori, relocated to Bulgaria. "I didn't want them to go, but what could I say?" said Mr Bulliqi. "There is nothing for them here. They were doing odd jobs, earning €10 a day. Better go to Germany and take your chances. I hope they will be able to stay." The sons have telephoned their four siblings to say they are OK, and awaiting the result of their asylum claim. They will, however, almost certainly then be deported, something Mr Bulliqi greets with a resigned shrug..
"My wife and I are old and tired, and it is sad that they had to go. "But what hope is there for them here?" Alta constructie artificiala impusa de britanici si americani care in viitor le va exploda in fata, ca toate celelalte de dinainte. Talibanii sunt si creatia finantarii americane alaturi de alti fundementalisti "rai" dar care inainte au fost "buni". Impartirea orientului mijlociu si promisiunile fara acoperire sunt creatia britanica. Si multe altele precum Irak si Afghanistan. E interesant ca aleg calea spre libertate sau spre ce cred ei ca e libertate tot prin Serbia. Ok, ai vrut sa fii independet, te-au ajutat cei mai puternici, dar sa renunti asa brusc la independenta ca sa traiesti ca refugiat? Dar mai pot fi numiti refugiati? Nu se face nicio referire insa la etnia celor 50.000 de azilanti. Poate sunt sarbi. Alfel ce motiv ar fi sa ceri azil dupa ce ai devenit "liber" si "independent", dupa ce ai fost sprijinit ca albanez sa scapi de "opresiunea sarba" !? Sa vrei sa fugi dintr-un stat cu protectie occidentala !? Eu "decat" mi-am pus intrebarea. Poate ca uni sunt sarbi iar restul doar se declara sarbi caci altfel nu vad ce justificare ar putea sa aiba pentru solicitarea azilului intr-una dintre tarile care s-au straduit sa produca independenta Kosovo si s-o recunoasca, garantand astfel mai mult sau mai putin direct ca acolo ar exista libertati si legitimitate pentru existenta unui stat.